We dug this up from last year. One sees how little things change. Only in passing, and probably on the margins of the official program, will they get into the tremendous monopoly and monopsony power of their companies, ability to play one jurisdiction against another in order to avoid taxes, how to ban organized labor in their companies, how to use government ambulance services to carry workers who have fainted from extra heat (to save expense of air conditioning), how to make their workforce complement its wage through private charity donations, or perhaps how to pay the average tax rate between 0 and 12% (Trump to Romney). If they are from the emerging market economies they can also exchange experiences on how to delay payments of wages for several months while investing these funds at high interests rates, how to save on labor protection standards, or how to buy privatized companies for a song and then set up shell companies in the Caribbean or Channel Islands. Still poverty and inequality which are, as we know, the defining issues of our time will be permanently on their minds. It is just that somehow they never succeeded to find enough money, or time, or perhaps willing lobbyists to help with the policies they will all agree, during the official sessions, should be done: to increase taxes on the top 1% and on large inheritances, to provide decent wages or not to impound salaries, to reduce gaps between CEO and average pay, to spend more money on public education, to make access to financial assets more attractive to the middle and working class, to equalize taxes on capital and labor, to reduce corruption in government contracts and privatizations. Since they have been singularly unsuccessful in convincing governments to do anything about rising inequality–will they lament– it is not surprising that nothing has been done. Or rather that the very opposite policies have been conducted: Trump has, as he promised or threatened, passed a historic tax cut for the wealthy while Macron has discovered the attraction of latter-day Thatcherism. Nothing positive of note seems to have been done in the emerging market economies either (with perhaps the crackdown on corruption in China the only important exception). This return to the industrial relations and tax policies of the early 19th century is bizarrely spearheaded by people who speak the language of equality, respect, participation, and transparency. None of them is in favor of “Master and Servant Act” or forced labor. It just so happened that the language of equality has been harnessed in the pursuit of structurally most inegalitarian policies over the past fifty years, or more. And indeed, it is much more profitable to call journalists and tell them about the nebulous schemes whereby 90% of wealth will be, over an unknown number of years and under unknowable accounting practices, given away as charity than to pay suppliers and workers reasonable rates or stop selling information about the users of platforms. It is cheaper to place a sticker about the fair trade than to give up the use of zero-hour contracts. They are loath to pay a living wage, but they will fund a philharmonic orchestra. They will ban unions, but they will organize a workshop on transparency in government. 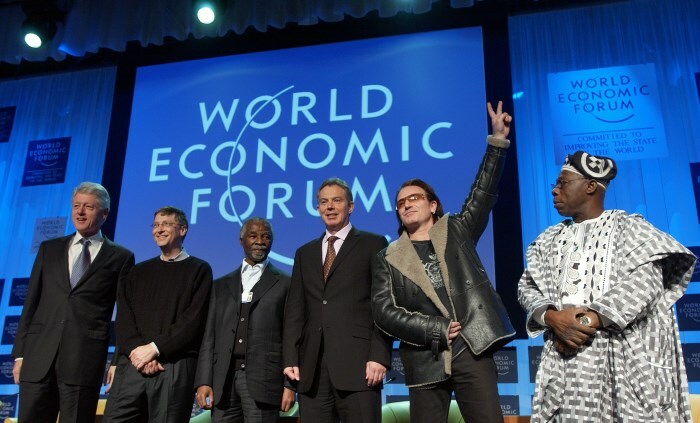 So in a year, they will be back in Davos and perhaps a new record in dollar wealth per square foot will be achieved, but the topics, in the conference halls and on the margins, will be again the same. And it will go on like this…until it does not.